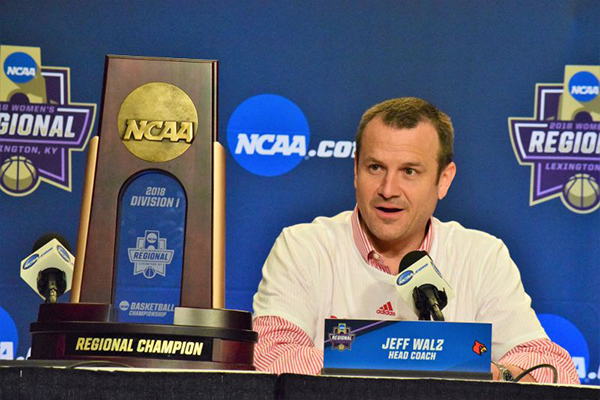 If you look at Jeff Walz’s coaching resume, it is a very impressive one already. And the youthful-looking U of L women’s basketball coach is only 46 years old. After guiding his Cardinals to last Sunday’s 76-43 victory over Oregon State in an Elite Eight matchup at Rupp Arena, Walz can now add another NCAA Final Four trip – his third one as head coach — to his resume. 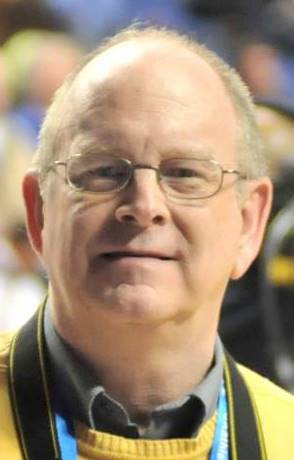 In 2009 and 2011, Walz, who is a native of Fort Thomas in Northern Kentucky and played basketball at Northern Kentucky University, sent Louisville to NCAA runner-up finishes. His current 36-2 Cardinals — who have won 11 straight games, including winning Atlantic Coast Conference regular season and tournament titles — will face Mississippi State in a national semifinal showdown on Friday in Columbus, Ohio. Asked about his current squad, Walz said, “I can’t say enough about their character. The basketball stuff is there, that’s great. It’s their character. It’s who they are. It’s what they do off the floor. You can’t be a great basketball team and have the results you want if you don’t carry it over in your personal life. And we truly do have wonderful young women who are wonderful role models to my children, to (associate) coach (Sam) Purcell’s children and that means more to me than winning basketball games. Walz — who currently has a 27-9 career record (.750) in NCAA tournament, ranking among the best in all-time winning percentage — is about to enter another milestone –his 300th career victory. Under his leadership, the Cardinals have compiled a remarkable 299-95 mark over the past 11 years. All-American senior Myisha Hines-Allen said her coach’s tourney success comes from his eagerness to study the game when he was a player at NKU where he had a full athletic scholarship. Walz, to his credit, doesn’t let basketball consume his personal life. He has a family to spend time with, including four children. Moments before last Friday night’s NCAA Sweet Sixteen matchup with Stanford, he had a daughter sitting on his lap on the bench during his team’s pregame practice. Walz – who doesn’t wear a suit jacket or tie — says he doesn’t feel much if any, pressure or stress during March Madness. “Not one bit,” he said when asked about feeling stressed out. “I haven’t missed a shot in 22 years,” he quipped. “You know we’ve done all of our (pregame) work, and then my time comes when the game starts. Before that, I’m not one of those (coaches), that you can’t talk to me, don’t do that. That’s why I love coaching women’s basketball. You asked me that question about would you be interested in a men’s job (at U of L). No. I want to sit there with my daughter to experience it. That’s what it’s all about. Memories like that that I’ll be able to sit there and share with her in 10 years. “You know, Coach Purcell’s daughters got on the big screen (at Rupp Arena) and our players were watching the (first) game out in the hall, and they all just started (to say), ‘Oh, your girls are on, your girls are on.’ That’s what it’s all about. “Sure, if you don’t win enough games, you get fired. It’s part of it. But I love what I do, but it’s not my life. I tell people all the time, I’m going to play the Powerball (in Kentucky Lottery). I’ve got my tickets. I think it’s $485 million and there’s a chance if I win, Steph (associate head coach Stephanie Norman) might be coaching tomorrow (meaning the Elite Eight game). I’d like to go count (the money). I’ll ask for it all in 5s and 10s. 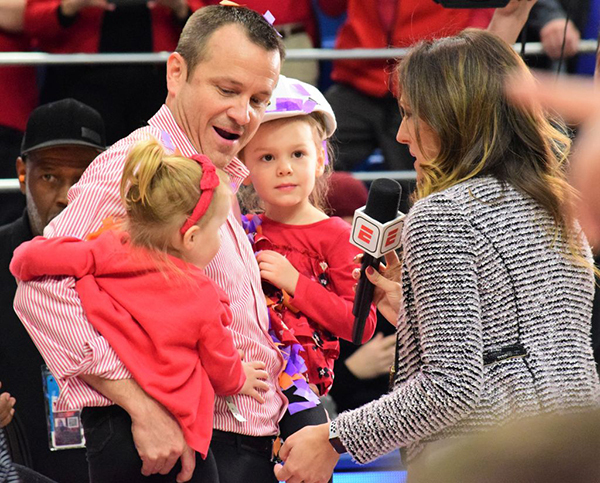 After beating Oregon State, the personable coach also held his two daughters while having a postgame interview with ESPN’s Allison Williams. By the way, Walz is not the only member in his immediate family with an impressive basketball background. His younger sister, Jaime Walz Richey, is now a successful girls coach at Highlands High School where her teams have won over 300 wins in her 16-year coaching career. She also had a storied career as a prepster at Highlands, earning Gatorade and Parade Magazine national player of the year honors in 1996. She was also named Miss Kentucky Basketball while setting all-time scoring records with most career points. And when Jaime arrived at Western Kentucky University, her brother was just beginning his second year at WKU, serving as an assistant to coach Paul Sanderford, who had taken the Lady Toppers to three Final Four appearances in 1985, 1986 and 1992, including one national championship game appearance. She has been inducted to several sports hall of fames, including Kentucky High School Athletic Association Hall of Fame. Jaime and the rest of the family are enjoying the March Madness this year, and they have been following Jeff and the Cardinals very closely in the NCAA tourney. Added Jaime on Monday night, “I was able to attend both of the (Lexington Regional) games at Rupp. Our whole family was there – mom and dad, two older brothers Scott and Brian along with all of our spouses and kids. Fifteen of us. He has seven nieces and nephews that were all there and will be in Columbus, also. Jaime has several stories or memories about her older brother, Jeff. She said he used to make her cry while playing horse in the backyard. “He wouldn’t let me win,” Jaime recalled. Jeff Walz was asked Sunday what has been the most rewarding part about this year’s U of L team. “It’s getting these young women the opportunity to experience it (Final Four),” said Walz. “As a player, it’s 10 times better than as a coach. Are you kidding me? I mean, it’s great. Don’t get me wrong.